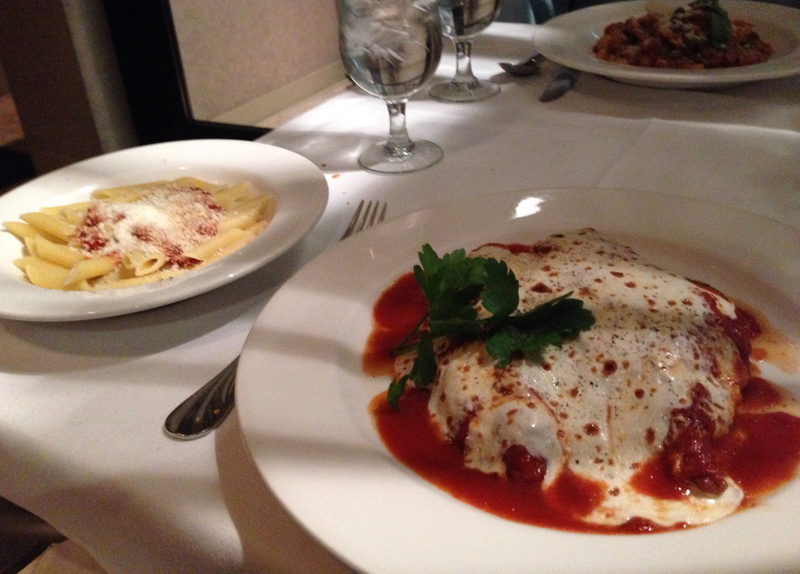 By now, you know that I’m a snob when it comes to Italian food. I rarely venture to restaurants that serve up such fare, and, when I do, I’m highly critical of them. (For reference, see my Sauce review.) Another thing about me that you may or may not know is that I’m a sucker when it comes to restaurant recommendations from people I know. Two coworkers recommended Queen, an Italian restaurant, to me. Situated beside a few fast food joints in Brooklyn Heights, Queen is a rarity. It’s the kind of old-school Italian restaurant I recall from my youth, growing up in New Jersey. Apparently, it’s been around for years and has survived the ebb and flow of its neighborhood. I wandered around the dimly lit streets of Brooklyn Heights for about 15 minutes before finding Queen. Buildings cowered behind scaffolding and the street names were meaningless. Luckily, I finally navigated to the restaurant, arriving 10 minutes late for our reservation, using seldom trusted Google Maps. When I entered the restaurant, I was struck by the ambiance. It was warm, yet felt very dated. Though the neighborhood has changed, it appears Queen has maintained its roots in Jerseyan Italian restaurant decor. We were told the wait would be 15 – 20 minutes, despite our reservation, and then were eventually sat right next to the door, with a great view of a hardware store across the street (the LED sign on the exterior informed me that they sell paint and make keys, if you’re wondering). A member of the waitstaff promptly brought over a plate of various breads, including a few slices of regular Italian bread, crisp breadsticks and–my favorite–two pieces of something like focaccia covered with marinara sauce. We ordered two glasses of reasonably priced pinot grigio, but that’s where the bargain at Queen ended. We opted for the housemade mozzarella, which, I anticipated, would be fresh mozzarella, as opposed to a globe of cheese they took out of the fridge. I was wrong. It was dense and nearly flavorless, and, for a whopping $16.75, came with just a few random pieces of soppressatta. Though the cheese was a minor disappointment, I pressed on with hope that our entrees would be better. I ordered the chicken parmigiana, which is accompanied by a plate of penne pasta with marinara sauce. A thick layer of melted mozzarella cheese covered the breaded chicken with marinara sauce featured aplenty. This dish was fine. I ordered it because I figured it’s very difficult to go wrong with such a simple dish. I was neither disappointed nor impressed. MDP got the gnocchi with veal and pork ragu. I enjoyed the ragu in his dish, but the gnocchi were clearly overcooked. They were a tad slimey and too soft. He finished his plate, but he wasn’t sold on Queen either. 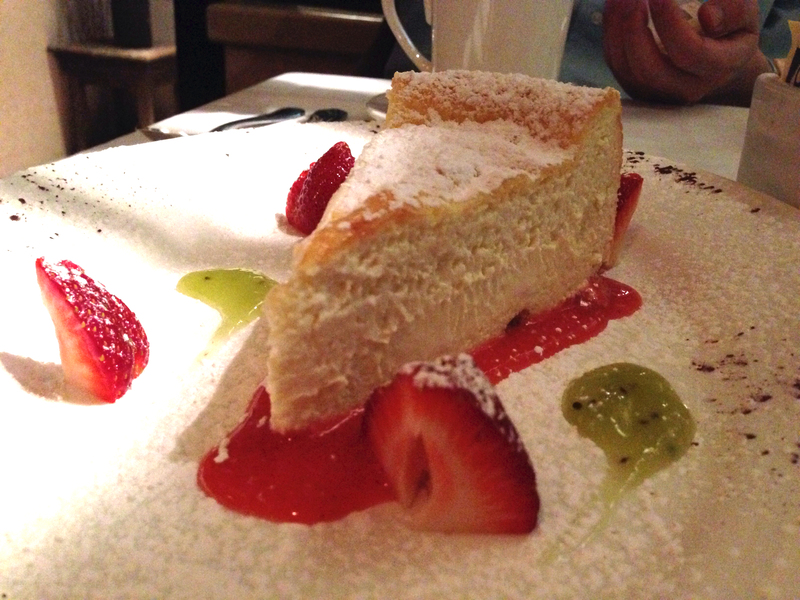 For dessert, we tried the ricotta cheesecake. With two fruit syrups drizzled around the plate, the ricotta cheesecake tasted just like, well, ricotta. There was a hint of lemon zest, but the dish lacked any semblance of sweetness. I recall the ricotta cheesecake at Palma, which was creamy, just sweet enough and totally delightful; Queen’s rendition paled in comparison. The bill was more than $100, which is fine, but neither MDP nor I felt as though the quality of the food justified the prices. So, if you’re looking for Italian places to try, skip Queen. 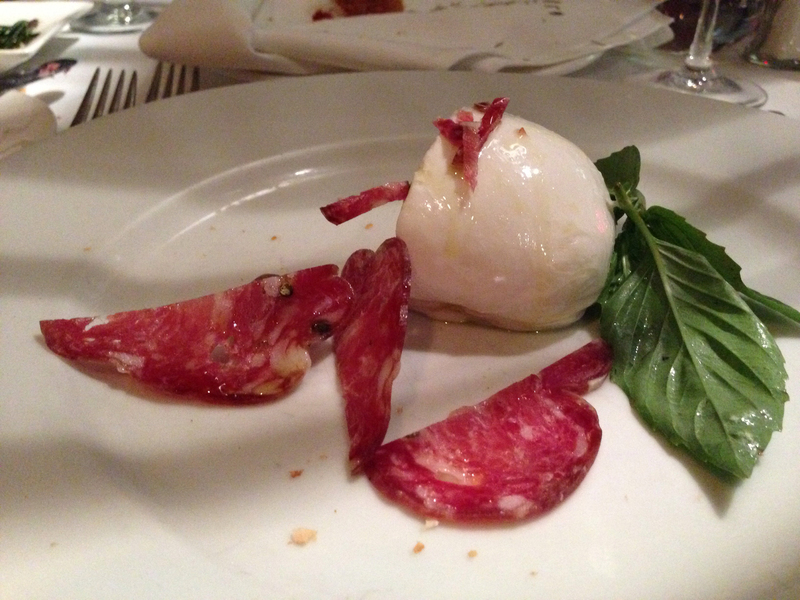 For top-notch Italian food, try Palma or Emporio, which are both located in Manhattan, instead. Take the 2/3/4/5/R to Borough Hall and walk a few blocks.